NEW YORK -- The United Methodist General Board of Global Ministries has announced that on Dec. 2, 2014, it will match up to $1 million in gifts made online to any project through The Advance as part of UMC #GivingTuesday. Marie Kuch-Stanovsky, who chairs the communication and development committee of Global Ministries’ board of directors, expressed enthusiasm about last year’s record $6.5 million raised online through The Advance on UMC #GivingTuesday. Directors approved allocating matching funds dollar for dollar up to the first $1 million in gifts to Advance projects received online on Dec. 2, between 12 a.m. EST and 11:59 p.m. Kuch-Stanovsky explained that to stretch the matching funds, a maximum of $2,500 per individual gift to a project will be dispersed as matching funds and a project may receive a maximum of $25,000 in matching funds. UMC #GivingTuesday is part of an international movement that builds on the recent U.S. shopping traditions of Black Friday, Local Business Saturday and Cyber Monday. It offers an opportunity to start off the holiday season by giving instead of getting through supporting organizations that have been researched and approved by the United Methodist General Board of Global Ministries. And 100 percent of all gifts made through The Advance are given directly to the designated project. For example, thanks in part to gifts made last year on UMC #GivingTuesday, the Tanzania Provisional Conference of the North Katanga and Tanzania Episcopal Area purchased of 15 acres of property in Dar es Salaam. The property will be home to a new United Methodist Church mission center for the conference that will support ministry projects in Tanzania. Through The Advance, United Methodists can give to more than 850 United Methodist-related projects worldwide. Donors can also provide support for any of more than 300 missionaries. Together, the projects meet a range of needs, from helping survivors cope with natural or civil disasters to helping communities build churches, feed and educate children, and equip hospitals and clinics. Global Ministries offers resources to promote and share the UMC #GivingTuesday campaign at www.umcmission.org/givingtuesday. 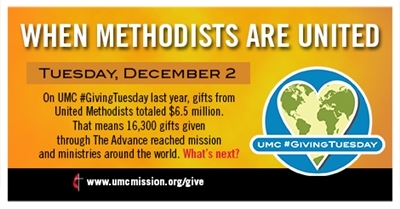 To make a contribution, donors will go to www.umcmission.org/give on UMC #GivingTuesday, Dec. 2, and donate online to any of the hundreds of projects and missionaries listed there. To search for projects, click here.